What a comeback performance! 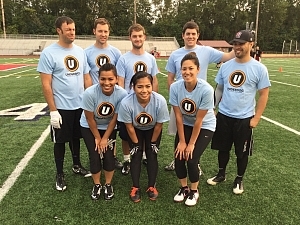 Trailing by 2 scores late in the game, Triple Ecks mounted a defense-fueled rally to stun Gameface, 28-24. Ryan A sealed it with a pick 6 in the two minutes to put his team ahead for good and take the game. He also contributed 3 TDs on offense in a great all around performance.